Whoever invented the rotisserie chicken is a genius, along with the roasters that are now in most grocery stores; these succulent whole chickens provide us with instant dinner, and leftovers for another meal. Whether you want to whip up a delicious dinner to enjoy while watching the NCAA Basketball tournaments or just make a satisfying homemade meal, the moist rotisserie chicken allows for quick, easy and tasty weeknight meals. 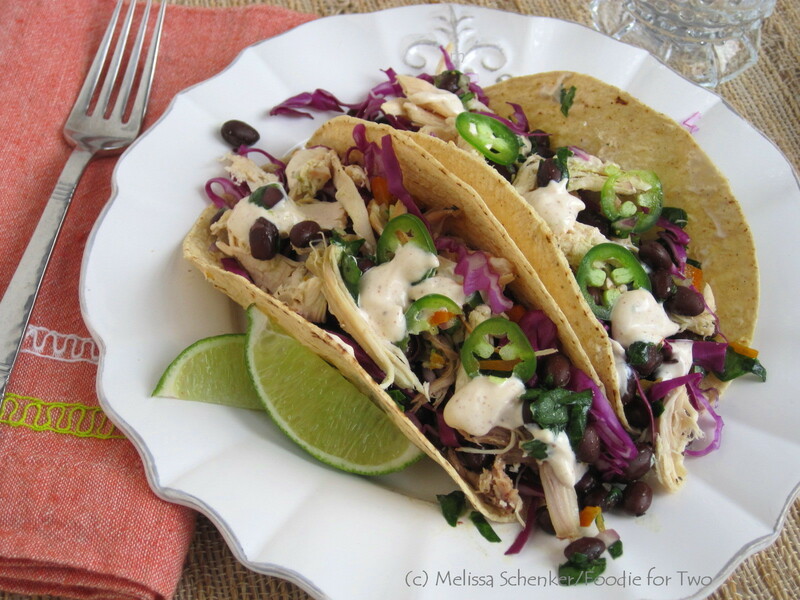 Here the shredded chicken has been put to good use in Chicken Tacos with Black Bean Salad, Red Cabbage & Chipotle Lime Sauce. My infamous Black Bean Salad has been featured on Foodie for Two before, where it was paired with seared ono, and today the ingredients are slightly modified to give the taco a makeover with light yet hearty flavors. It works fabulously in soft tacos with some warm corn tortillas, shredded chicken, thinly sliced red cabbage, sliced jalapeño and finished with a chipotle lime sauce. The sauce is rich and creamy and brings all the other flavors together with just enough earthy spice from the chipotle, and brightness from the lime. The versatile sauce is made with some mayonnaise, sour cream, lime zest and juice and dried chipotle pepper powder – my secret ingredient. 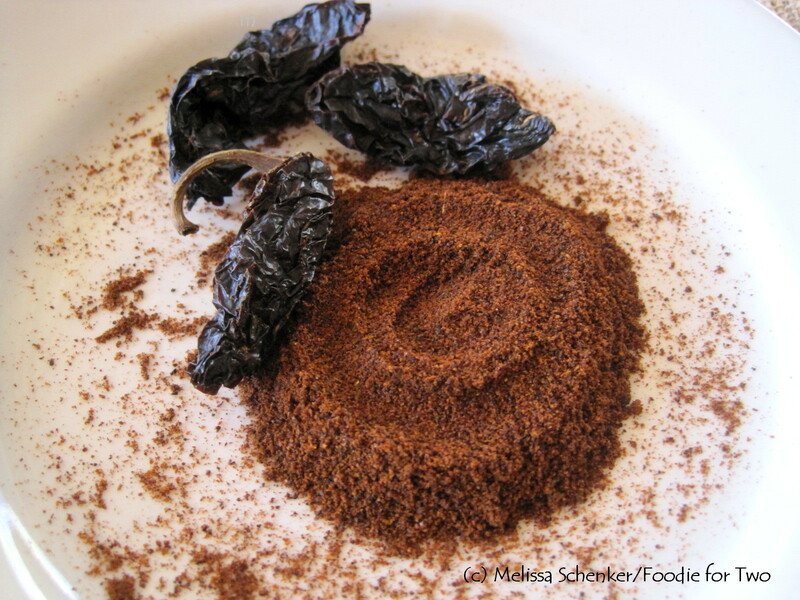 Chipotle peppers are just fully-ripened, dried jalapeños and available in either whole dried peppers (seeds, stems and all) or dried pepper powder. I find the powder in the spice aisle of my grocery store (or from Savory Spice) and the whole peppers in the Mexican food aisle. The spiciness from the jalapeño is concentrated and it has a wonderful earthy, smokiness that adds a surprising depth of flavor to dishes or sauces. To make dinners super easy, I like to remove all the meat (yes, the dark meat too) from the bird when I get it home and then store it in an air tight container in the refrigerator. This time I selected the colossal bird, which was only a dollar more than the regular size, and it yielded about 5 cups of shredded chicken – plenty for this meal. If you aren’t going to use the chicken within the week, just bag it up in one cup measurements and freeze for later use. How could delicious homemade dinners be any easier? This is also a great recipe for a small crowd: double or triple the amounts (depending on the number if people) and set everything out buffet style. Enjoy! Black Bean Salad: Add the black beans, red onion, bell pepper, spinach, lime zest and juice, cilantro, Poblano pepper, olive oil, garlic, salt and pepper to a medium bowl and gently stir together with a spoon so the beans don’t break up. Let the salad sit for at least 15 minutes to let the flavors develop; can be made up to one day ahead – the beans will break down a bit from the lime juice but the flavors won’t be affected. Store leftover salad covered in the refrigerator, makes about 2 cups. Chipotle Lime Sauce: Add all ingredients to a small bowl and mix well. Let sauce sit for at least 15 minutes for the flavors to develop. Can be made up to 2 days ahead; store covered in the refrigerator, makes about 1/3 cup. Assemble: For the rotisserie chicken, remove all of the meat off the bone and reserve 1 cup for the tacos. 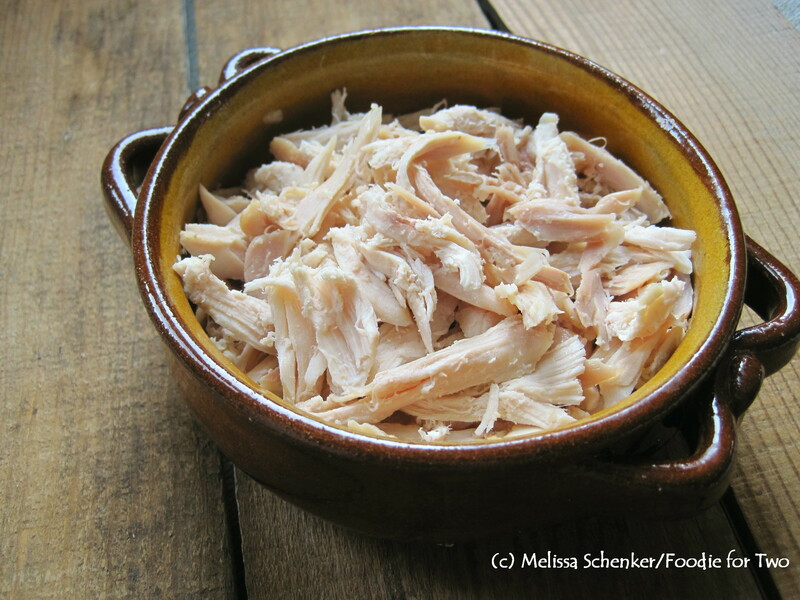 Store the remaining chicken in an airtight container in the refrigerator for up to 1 week, or bag the shredded chicken in 1 cup servings and freeze for later use. Heat the oven, or toaster oven, to 350º and wrap the corn tortillas in foil. Let them heat in oven for about 5 minutes. Thinly slice the red cabbage and jalapeño slices and gather all of the ingredients on the cutting board to start assembling the tacos. When the corn tortillas are warm, fill each of them with about ¼ cup of the black bean salad, 1/8 cup of shredded red cabbage, ¼ cup shredded chicken, a few small dollops of chipotle lime sauce, garnish with the sliced jalapeño and cilantro leaves and serve immediately. The Tulip Fence: Last September I planted over 100 tulip bulbs in planters and in the backyard (my first time ever), and they are starting to come up. 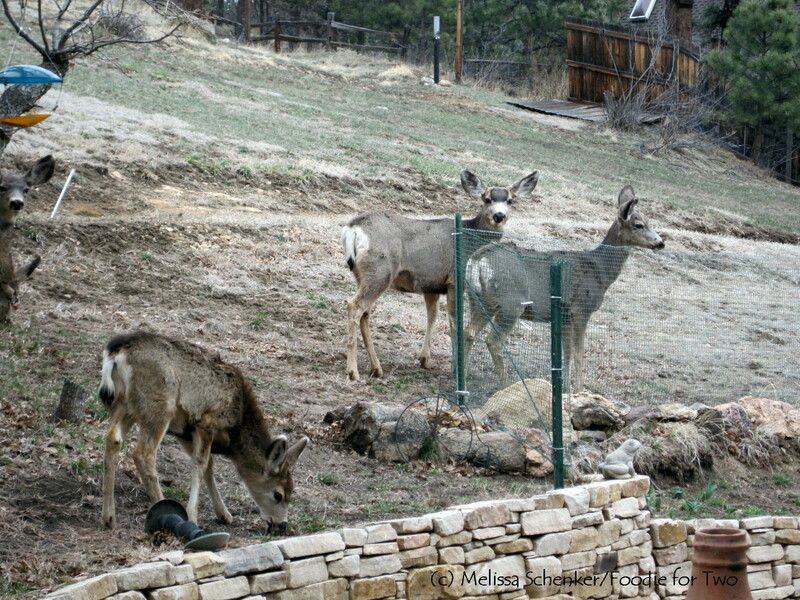 Not surprisingly, I found a mule deer munching on the tender shoots this weekend and chased her away; David put up a quick fence for protection and it worked! Thanks, honey! Here you can see she has returned and is trying to figure out how to get to them. No tulips for you, my deer! Happy St. Patrick’s Day, or Beannachtam na Feile Padraig! I have to admit, when I heard the words Corned Beef and Cabbage they didn’t conjure up an appealing image for me. Boiled cabbage? Yuck, I said. David had asked me to make a St. Patrick’s Day meal for many years and I finally relented about five years ago. I wanted to figure out how I could put my own twist on the recipe and cook the cabbage to make it more appealing. But what did I know about the Holiday itself? 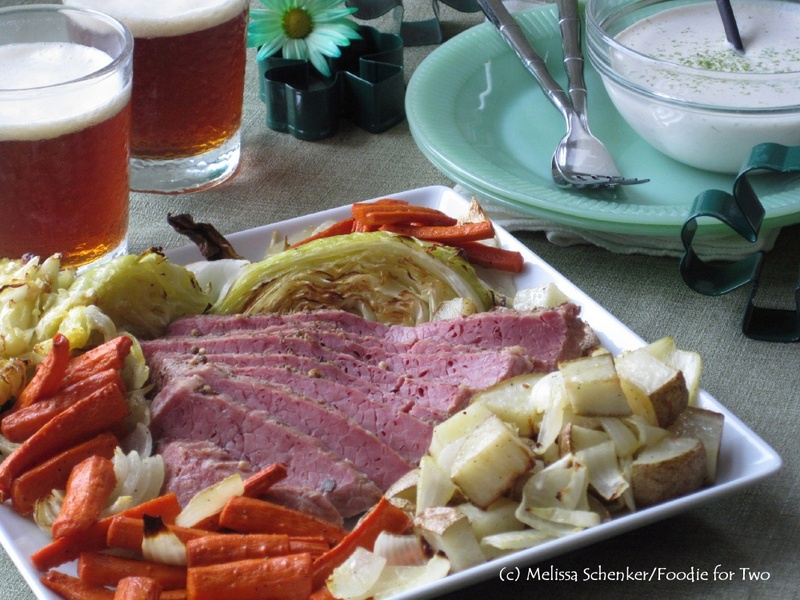 To celebrate the Holiday in America, we wear green, eat corned beef with cabbage and drink green beer – why do we do that? When Irish immigrants came to America in the 1840’s during an exodus brought on by the Great Potato Famine, they also brought with them their customs and heritage. The patron saint of Ireland is St. Patrick and he is celebrated on March 17, which marks his feast day and the anniversary of his death. It is a national holiday in Ireland and is actually a religious holiday as it falls during the Christian lent season (meat restrictions were lifted for the holiday). Traditionally, Irish bacon is eaten on the holiday but early Irish Americans soon found it too costly so corned beef was substituted. The Irish celebrate their heritage through stories, feasting (including drinking beer), music and symbols. Where did the green come from? The shamrock is a sacred Celtic plant and symbolizes the rebirth of spring. In the 17th century when the English occupied their land and enacted laws which forbade the Irish from speaking their native language and practicing Catholicism, the Irish people started wearing shamrock symbols (possibly the actual plant) to show support for their heritage and to speak out against their oppression. We still celebrate the Irish heritage today with feasting, drinking and incorporating as much green as we can. In true American style, we have embraced the holiday and made it our own. For the corned beef, I use the flat cut brisket. 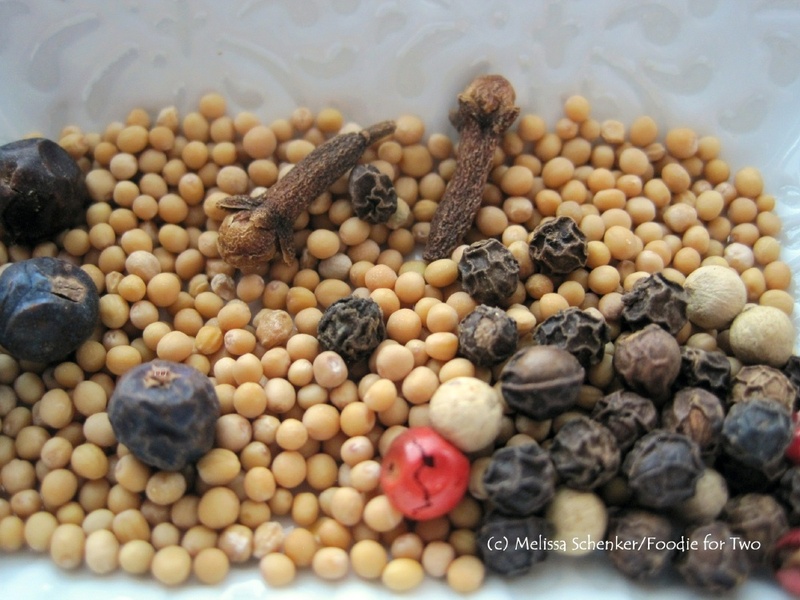 It comes with a spice packet, which I use for the braising liquid along with some extras to add even more flavor: juniper berries, yellow mustard seeds, whole cloves, fresh cracked pepper, celery seed and bay leaves. Once again, at my high altitude I have to cook the meat and vegetables longer but the recipe has a note for how to accommodate that. One of my favorite cooking methods for vegetables is to roast them in the oven with some olive oil, salt and pepper (picture on left). The vegetables become soft and caramelized with tons of flavor (picture on right). Cabbage reacts the same way and is delicious when roasted. So, instead of the boiling method I roast it. 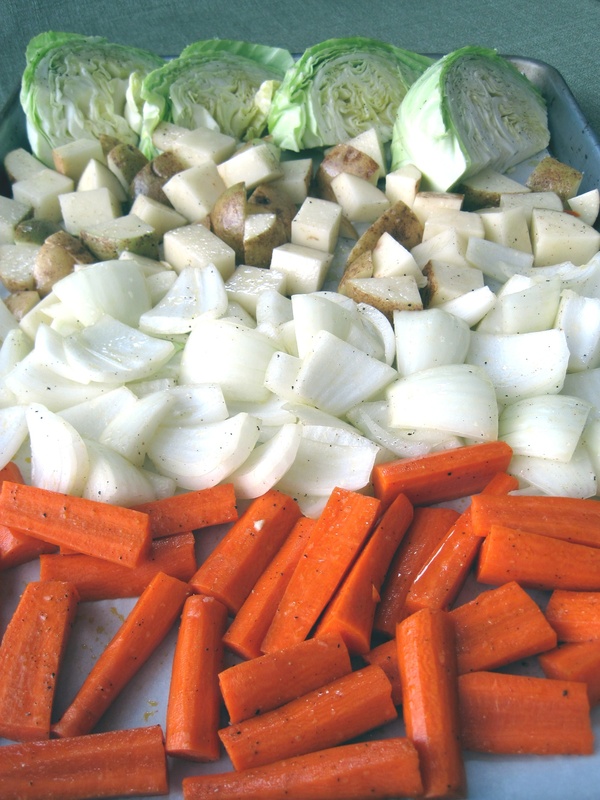 To add more color, flavor and texture I also throw in carrots and onions. 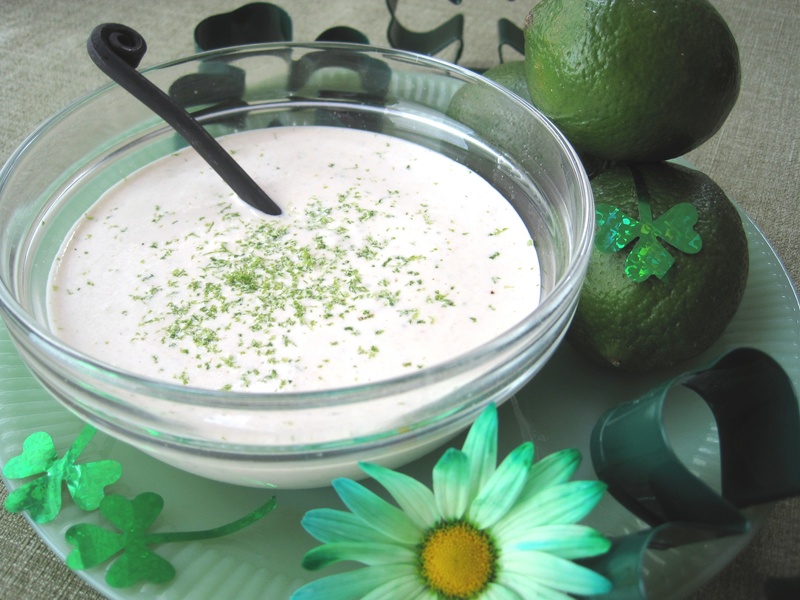 How about a Lime Horseradish sauce to mix things up? It is an easy way to put a modern twist on the ordinary, not to mention it has green in it. Save your leftover meat, vegetables and one cup of the braising liquid for breakfast. 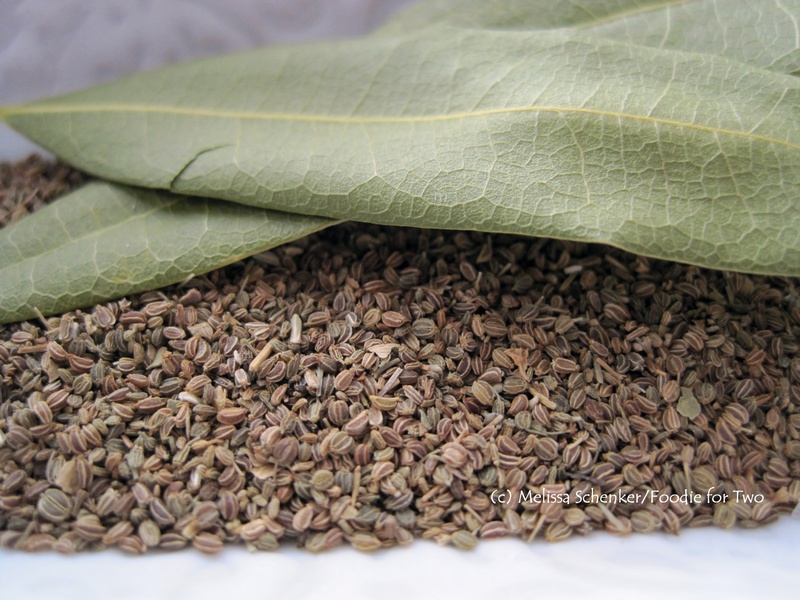 My next post for Thursday, St. Patrick’s Day, shares how you can use the leftovers for Corned Beef Hash. Mix all ingredients together and stir well. If you like it hotter, add more horseradish. Cover and refrigerate until dinner is ready. Heat oven to 300 degrees. Rinse the meat well and pat dry. In a large Dutch oven, sprinkle the spice packet on the bottom. Place the meat on top, fat side down. 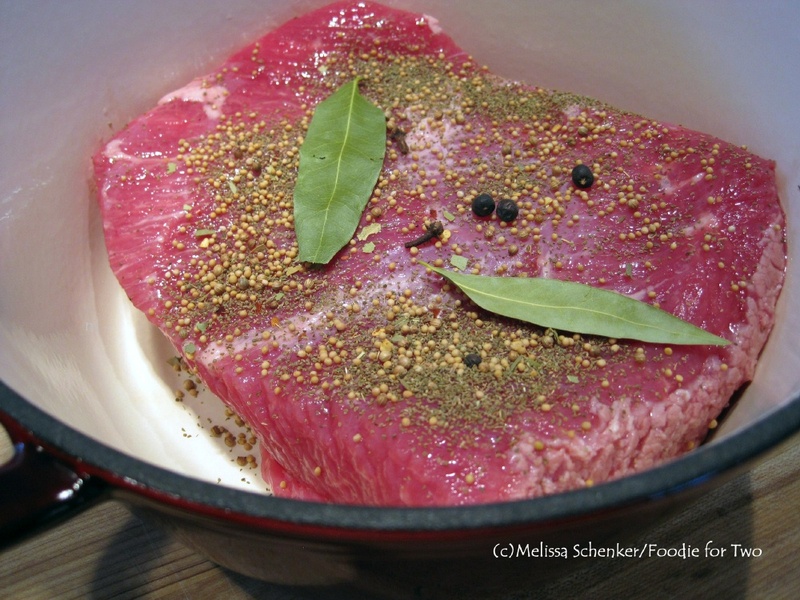 Sprinkle the remaining spices on top of the brisket and add the water – just enough to cover the meat. Cover with lid and cook in oven for about 3 hours (3 ½ to 4 hours for high altitude) until meat is fork tender. Turn brisket over halfway through cooking. Line a sheet pan with parchment paper. Place the cabbage wedges on one end of the sheet pan and drizzle both sides with olive oil and season with salt and pepper. In a large bowl, add the potatoes and drizzle with a few teaspoons of olive oil and liberally season with salt and pepper; toss well to coat. 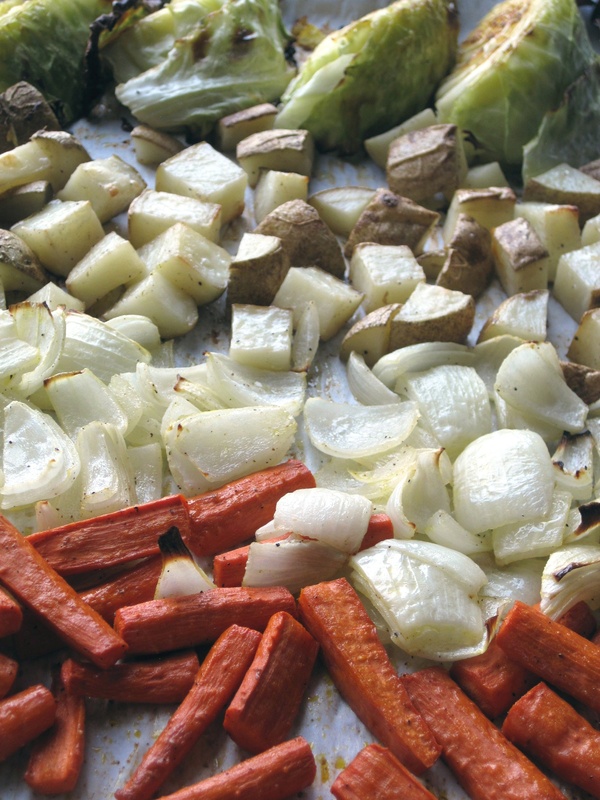 Transfer to sheet pan, keeping all vegetables together. Repeat process separately for the onions and carrots. Cover sheet pan tightly with foil. Place in the oven during the last hour of the corned beef cooking time. Cook for 45 to 50 minutes until fork tender (for high altitude cook for 60 minutes). When the corned beef is fork tender, remove it from the oven. Remove the foil from the vegetables and place back in the oven. Increase oven temperature to 400 degrees and let finish browning while the meat rests. Serve: Place the corned beef on a cutting board, cover tightly with foil to keep warm, and let rest for about 20 minutes while the vegetables finish cooking. Reserve 1 cup of the cooking liquid for leftovers: corned beef hash. Slice the meat against the grain into thin slices. Shingle the slices in the middle of a platter and add the roasted vegetables around it. Pour two or three ladles of the braising liquid over the meat and vegetables and serve immediately. Serve with lime horseradish sauce and your favorite Irish beer.